Rangers linked with highly rated Scotland Under-21 starlet, Brendan Rodgers confirms injury to key Celtic man and which Ibrox midfielder is set for a Scotland recall? Rangers are keeping tabs on former Chelsea youngster Harvey St Clair, and could make a move at the end of the season, according to reports. Ibrox coach Michael Beale advised the Scotland Under-21 international to turn down a new deal at Stamford Bridge and instead join Italian Serie B outfit Venezia. Brendan Rodgers has confirmed that Celtic goalkeeper Craig Gordon suffered an injury during the 2-1 win over RB Leipzig on Thursday night. Ryan Jack is set to earn a recall to the Scotland squad after Alex McLeish was rocked by another spate of call-offs from his Nations League squad. Full-back Stephen O’Donnell, defender Charlie Mulgrew and midfielder Kevin McDonald dropped out yesterday ahead of the games with Albania and Israel. Steven Gerrard has dropped the heaviest hint that he’ll ask the Rangers board and director of footbal Mark Allen to find him a number 10 in the transfer window. Ahead of today’s clash with Motherwell, the Ibrox gaffer said: “We’ve got creative players here like Scott Arfield, Ovie Ejaria or Daniel Candieas. Scott Brown and Olivier Ntcham are still very much in Brendan Rodgers’ plans, but he insists they face competition for their places in the Celtic team when they’re fighting fit again. 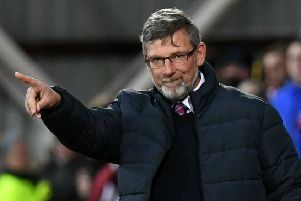 Hearts boss Craig Levein was left frustrated after watching his team dominate possession against Kilmarnock but lose 1-0. It was Hearts’ second defeat at Tynecastle in 18 months - dating back to a 2-1 defeat to Aberdeen in May 2017. Adam Bogdan is loving life at Hibs so much he wants to make the move permanent next summer. The Hungarian international, who is on loan from Liverpool, is enjoying the chance of regular first team football at Easter Road and would be happy with a long-term deal with the Hibees. Bogdan said: “Yes, of course, as Hibs is a very appealing club and Edinburgh is fantastic. I have a season-long loan at Easter Road, and I’m very happy in the city and at Hibs.